​With the personal development I have done, the shadow work, facing fears, and enjoying the abundance and beauty that life has to offer....I finally realise within doing so...I was actually fixing my relationship with all the major areas of life. 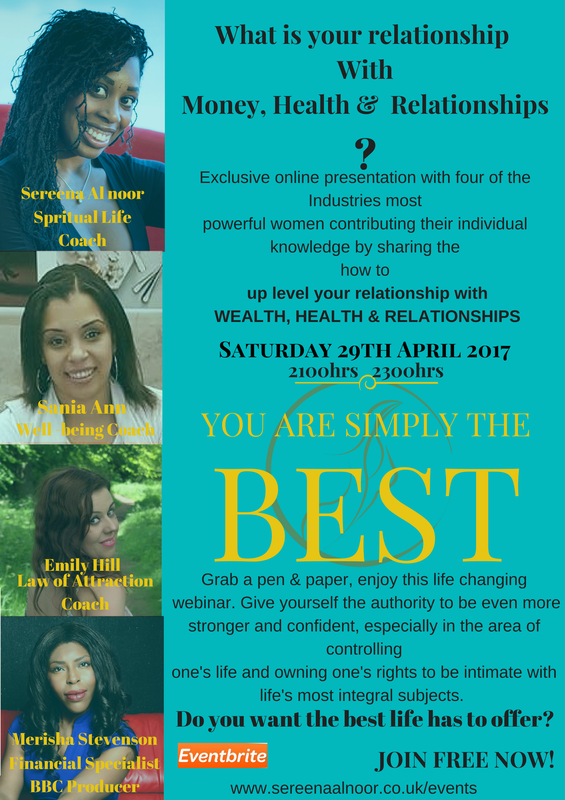 MONEY, HEALTH and RELATIONSHIPS...the lot! I Sereena Al noor have teamed up with 3 of the industries leading women Sonia Ann, Merisha Stevenson & Emily Hill together we have put together this wonderful evening where we will be blending all our expertise to bring you to high vibrations through chattter, laughter and sharing. BEFORE YOU GO! let me ask you.. whats your relationship with health? just think about the best friendship you have, does your relationship with health match that eep warm and meaningful feeling when your around your bestie? We all want more money, better health and improved relationships, probably not all at once for some of us, however, at least 1 or the becomes a major topic of interest. It is not surprising then, why at this time of the year, so many people suffer anxiety, stress and fatigue, particularly if certain goals and dreams have not yet been fulfilled or accomplished. SUNSHINE HEALS RETREAT will enable you to get away from the hussle and bustle of the city and not only provide you with the 5* holiday treatment that you deserve, but empower you to work your Mind, Body and Soul synergisticly, therefore preparing you for accomplishing greater success in 2018. Confidence Building * Improved Focus * Calming the Mind * Improved Concentration * Releasing of Positive Aura Energy * Clarity of Goals/Dreams/Purpose * Networking with Likeminded * Appreciation of Nature * Feeling of Self Worth * Inspiration & Motivation * Joy & Laughter * Exercise * Good Wholesome Eating * Healing * Knowledge of Ancient Jamaican History * Yoga * Takeaway NLP techniques.......... and much more! A variety of excursions can also be arranged. LIMITED SPACES AVAILABLE BOOK YOUR'S NOW to avoid dissappointment, Full cost will be for your ROOM, ALL MEALS, DAILY WORKSHOPS, DAILY YOGA CLASSES, GROUP MEDITATION, ANCIENT HISTORY TALKS AND GUIDED WALKS, ON SITE COUNSELLOR AND COACHING.